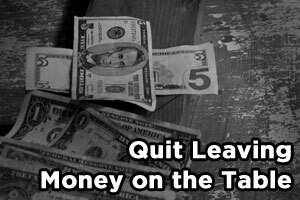 Are You Leaving Serious Money On The Table?! You already know by now that I am a huge cheerleader for having an email newsletter on your blog if you want to make any kind of significant income. I have beat that point to death so hopefully you are already using Aweber or some other email delivery program to jump start your earnings. Now…you might have already setup with quality content hitting your auto-responder series and are off and kickin’ with a great start or an established list, but…you might be leaving a serious amount of money on the table by not doing one simple task that takes all of 5 minutes to complete. No really…I’m serious…5 minutes and you are opening up a killer revenue stream that 99% of bloggers that I follow aren’t even doing. Broad broadcast emails have the highest open and click through percentages (readers get used to looking for them). My highest traffic days on the blog are blog broadcast days (Darren Rowse did a post about this same thing on DPS). Most of my Bike198.com readers have no clue about RSS or feed readers, so the blog broadcast acts as their subscription. It is all about providing different options, and this almost weekly (I have it set to send out when there are 5 new posts) email is a great, fundamental resource for my blogs. 99.9% of bloggers love the feature in Aweber with the blog broadcast, but where they go wrong is simple. Almost all bloggers using this feature setup the broadcast message and then leave it! That’s right…you are probably doing the same thing right now. Aweber makes it incredibly easy to setup, so it is an afterthought after the process is complete. Why would you change anything, it’s automatic right?! Well…as I said previously, my blog broadcast emails have some of the highest open rates on my newsletter, so naturally…I am going to want to extract as much as possible out of them and this is how I do it. 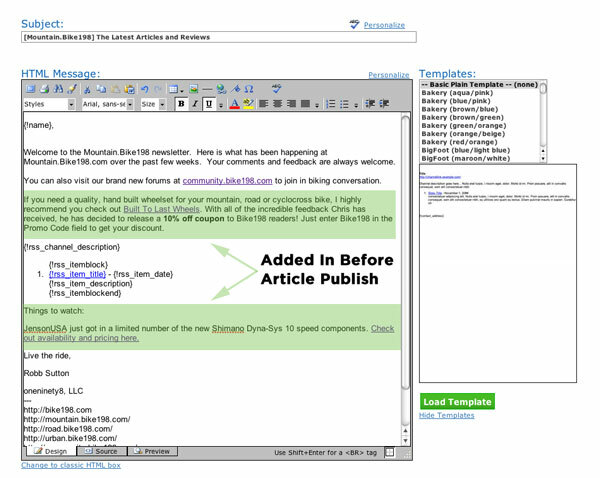 Like anything else in Aweber, your email messages are formatted. With the blog broadcast email, you have some necessary fields there that extract the title and excerpt from your feed and list it in the email. However, while you have to include those fields, the rest of the email is editable by you at any point in time. Want to unlock a new monetization stream? All it takes is planning ahead and paying a little bit of attention! I keep a constant watch on my blog broadcast message to see when it is going to go out next. A couple of minutes before I hit the publish button of the article that is going to send out the broadcast, I head over to Aweber and edit the email. The two spots in green were added in directly before I hit publish on the article that will trigger the blog broadcast to be sent out to my newsletter subscribers. How Do I Decide What To Put In My Blog Broadcast? Typically, you are not doing a “hard sell” email when you are sending out a broadcast. It is a “keeping everyone informed” style email so you need to treat what you add to it in the same manner if you want to keep its effectiveness. Here are some examples of what I add to my blog broadcasts in Aweber to make some extra income with my most successful and consistent email string. Updates from major online retailers (like you see in the bottom box above). Coupon codes and hot deals in the industry (like the top box that is not even an affiliate link…you don’t always have to promote things you are getting paid for). Paid links (Google can’t penalize your newsletter!). Hint: I have over doubled my opt-in rate with PopupDomination. You can see it in action on Mountain.Bike198.com and check it out here. Previous ArticleWhat Does Your Blog's Tagline Say About Your Blog? Great points you mention there regarding broadcast emails. Actually, many people do not even know that the broadcast feature exists or what’s it for. You are right, not doing broadcasts is like leaving money on the table. I’ve set mine up and do no changes to it…time to change! Thanks for the prompt and reminder. Great article, but I have a question. Do you only send out the blog broadcast to people who have opted into your newsletter via your ebook? The subscription box in the “stay connected” box is handled by Feedburner and not AWeber, correct? Currently I’m using Aweber’s broadcast feature (not blog broadcast) to send out my post updates and newsletter items. I’m wondering if I should separate the newsletter (Aweber) and blog subscription (Feedburner) portions as you do. Could you tell me the advantages to that? The blog broadcast is a function of Aweber, so you can not send that through Feedburner…it just uses your feed to construct the email. I keep them separate. There are people who will want to subscribe to your articles and not your newsletter, so they have that ability through RSS or Email through Feedburner. The newsletter subscription includes exclusive content and other emails that make it an actual newsletter. I see RSS and Newsletters as two different assets to blogging that are handled completely differently. Thanks for the advice. That’s a topic I’ve been on the fence about and it’s a relief to hear you put it so clearly. I think I’ll go the keep them separate route. Plus it will make delivering the blog updates easier since that is handled by my feed. I have my follow-up emails set-up but have not used the broadcast option yet. Do you create your broadcasts each day depending on what’s going in your niche or do you create the broadcasts in advance and schedule them to go out on certain days and times? The blog broadcast (when setup) automatically goes out when you hit a set number of recent posts. You can specify days and times it goes out if you want to, but mine just hits shortly after the post that triggers it is published. It is completely separate than your other broadcast messages. Great post! I am migrating my RSS Feed from FeedBurner to AWeber. My question for you is do you prefer to send out Full Posts or Excerpts? I actually write a personal message and then include a link. I use my email broadcasts as another chance to communicate with readers.